I had been dying to eat fresh Dungeness crab ever since featuring the local delicacy (not to mention Oregon’s state crustacean) on our December KBOO Food Show. Sure, nothing beats cracking crab on the Newport waterfront. But we’re only an hour away and can get them almost as fresh at our neighborhood seafood market, Harry and Annette’s Fresh Fish. They even cook up fresh crab for customers everyday. I probably still prefer the unadulterated sweet flesh, simply dipped in salted, drawn butter with a splash of lemon. 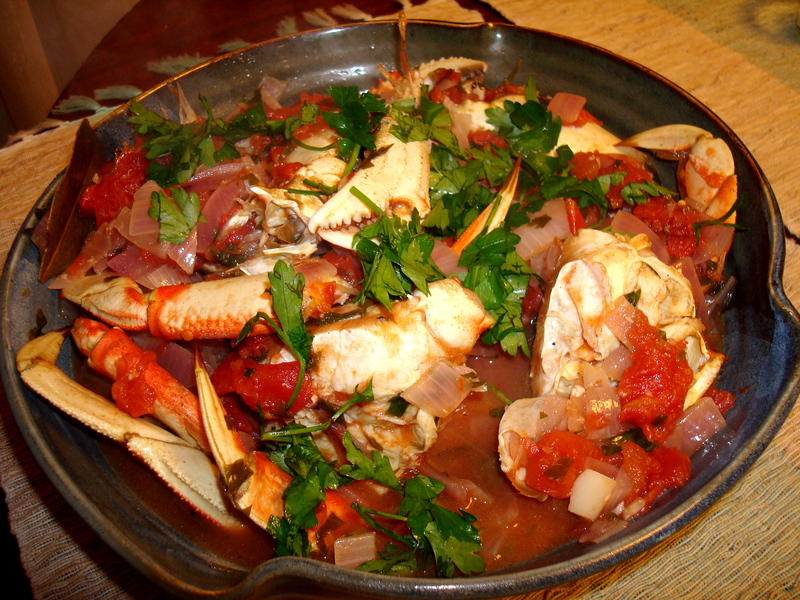 But this Cioppino-Style Roasted Crab in the current issue of Bon Appetit looked delicious and easy enough. It helped that Harry also cleaned and quartered the crab for me. Oh, if only I still had the clam broth on hand from last May’s digging expedition. Cracking the crab (and trying not to make a mess) as we ate was the only trouble with this dish. We just dumped the leftover meat in the spicy tomato broth, rather than assemble the leftovers into crab cakes, as Bon Appetit suggested. The stew’s a gussied up take on ole’ Maryland Crab soup. In fact, I now prefer Dungeness to the Chesapeake’s Blue crab. We served the cioppino with the recommended Lemon-Parsley Pasta, albeit a surprisingly edible gluten-free kind (more on that in another post!). We tried Bionaturae macaroni shells; Elaine, was that the kind you recommended? The stew was great, but we’ve both now had our seafood, at least crab, fill for a while. Oysters, however, are still calling to me.